WITH SECONDS to go, and as the West Indies pressed for the equalizer, Cornish goalkeeper Cairns dives to clear. The ball went straight to Alvin Corneal on West Indies left wing. From 15 yards he fired in his shot at goal, wide open before him, as Cairns lays sprawled on the ground. The ball smashed against the post. The last chance is gone, and West Indies suffered their second defeat in two matches. Once again the tourists showed their speed and individual control on a dry ground, but again they lacked combined skill. Had their efforts been but to a more united purpose they would surely have beaten this Cornish side, which was not as good as the one they met at St. Austell on Monday. This lack of combined effort did not show up so much in defence, which generally had a good game. Centre half Bill Rodriguez and left back Tyrone de la Bastide were particularly sound, while goalkeeper Rawlins Baptiste gave a lively and courageous display. Defences on both sides came out best on the whole. But West Indies could boast of the best forward in view to outside right Reg Haynes. It was Reg who scored the West Indies goal in the sixtieth minute when beating the goalkeeper for the ball. He cracked the ball into the net. His brilliant work almost brought the West Indies two goals in the opening minutes. First centered to inside left Ron Gray, whose head was well save by the Cornish goalkeeper. Then he whipped across another pass, and there was Gray again to meet it. This time his shot was inches wide of post. The West Indies were well on top at this stage, and had they been able to score a goal might well have settle the match decisively. But it was Cornwall who found the net when left winger Logan headed home from a corner in the twenty-fifth minute. 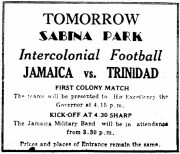 Just before half time, centre forward Anthony Hill scraped the post with a powerful drive, and a couple of fine saves by Cairns in the Cornish goal kept the West Indies forwards at bay. Defences seemed to have got the measure of attacks when the second half began. But Haynes did pop up to hit that equalizer, and West Indies were in with a fine chance. Then five minutes later, a shot from inside right Walter Goody which had goal written all over it accomplished its task. Cornwall had regained a lead which, despite the fast and furious efforts of the West Indies forwards in those closing hectic minutes, they were never to lose.